The name ‘spritz’ comes from the German verb ‘spritzen’, which means ‘to skirt’. It refers to the way the dough is extruded with a press or piping bag with patterned tip. The dough is placed directly on baking paper, and you can create sticks, round cookies, ‘S’ or ‘W’ shaped biscuits. The round Spritz make lovely decorations when you hang them with a ribbon! The ingredients are very simple: flour, almond meal (or hazelnut meal), sugar, egg and butter, with a pinch of vanilla. I replaced the butter with coconut oil in this recipe, and added a touch of gourmandise by dipping my Spritz in dark chocolate. 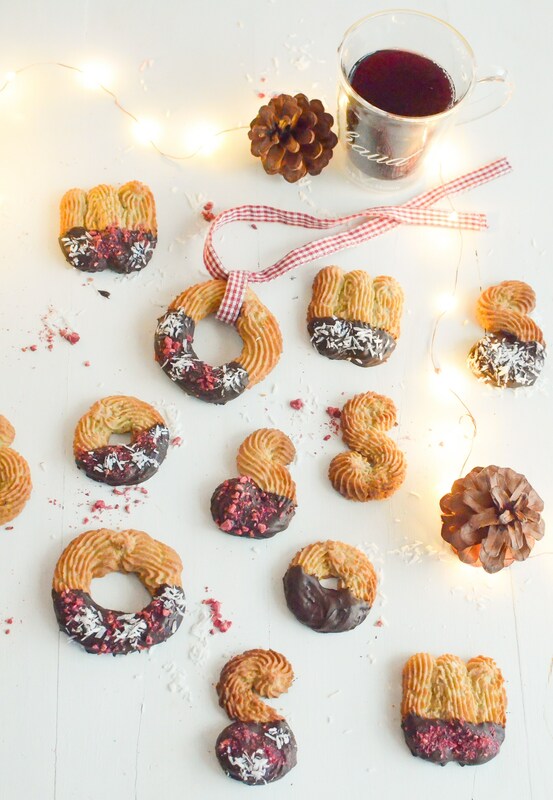 For an even more festive look, I sprinkled them with dessicated coconut and frozen dry raspberries. 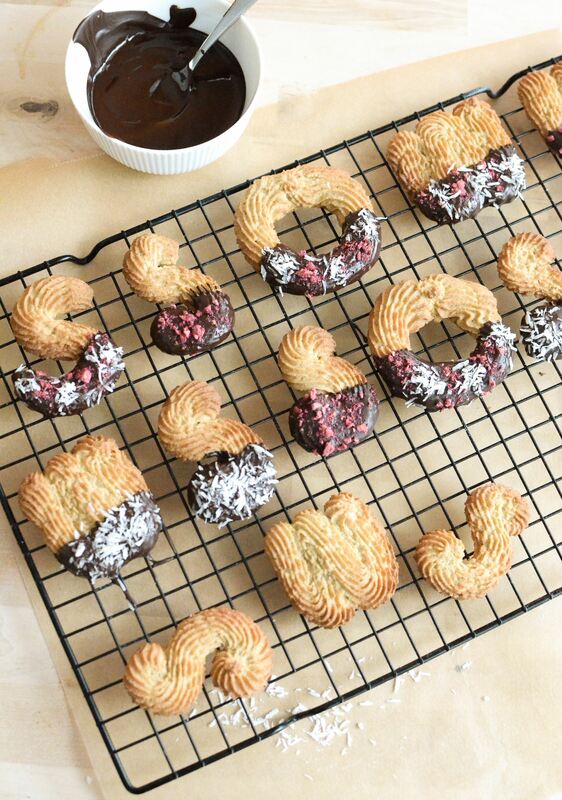 Make sure you let the biscuits cool down entirely before coating them with chocolate, so they have time to harden. I enjoy my cookies with a hot mug of Glögi, the Finnish spiced hot juice or wine, a cousin of the German Glühwein. Happy baking! 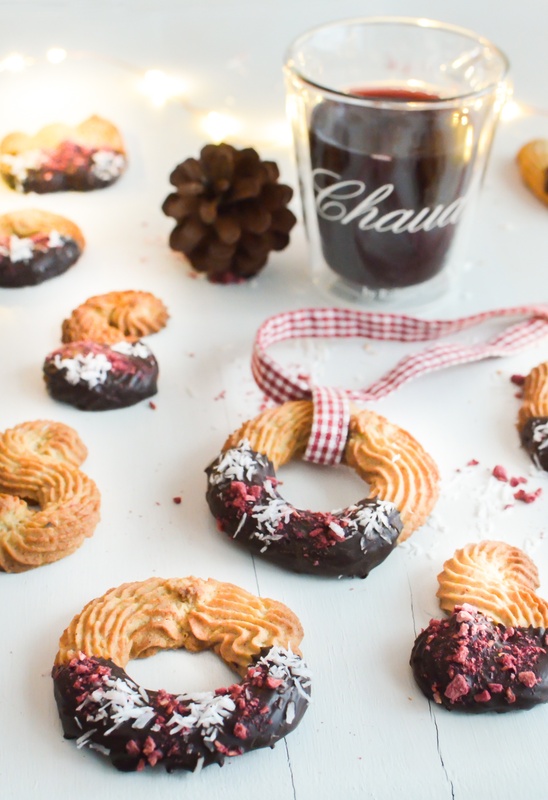 Alsatian-style gluten free Spritz biscuits based on almond meal and coconut oil, coated with black chocolate, to celebrate the Christmas holidays! In a bowl, mix all the dry ingredients: flours, almond meal, vanilla powder, sugar, salt. Then add the coconut oil, the milk and the egg. Mix well until smooth. Fill a pastry bag with a star shaped nozzle and pipe the biscuits directly on a baking sheet covered with parchment paper. Bake for about 12-15 minutes until the biscuits are golden. Allow the spritz to cool down entirely. Melt the chocolate in a bowl and soak the biscuits. 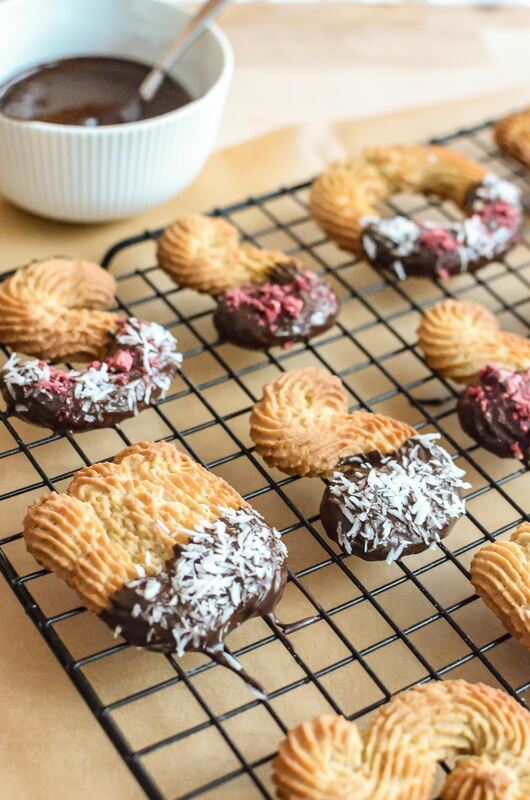 Sprinkle with desiccated coconut, crushed hazelnuts or other favorite topping. Let stand on a grid or parchment paper until the chocolate hardens. Spritz bredele à base de poudre d'amande et d'huile de coco, recouverts de chocolat noir pour plus de gourmandises! Mélanger les ingrédients secs dans un bol: farines, poudre d'amande, vanille en poudre, sucre, sel. Puis ajouter l'huile de coco, le lait et l'oeuf. Bien mélanger pour que la pâte soit homogène. Mettre dans une poche à douille avec embout cannelé et dresser en forme de 'S', W' ou autre forme, directement sur une plaque recouverte de papier sulfurisé. Faire cuire pendant 12-15 minutes jusqu'à ce qu'ils soient dorés. Laisser les biscuits refroidir complètement sur une grille. Faire fondre le chocolat et y plonger une partie des Spritz. Parsemer de noix de coco ou noisettes concassées selon vos envies, et laisser le chocolat durcir.